Evelyn White and Good Robot team up to make a Communibrew inspired by Maxine Waters. 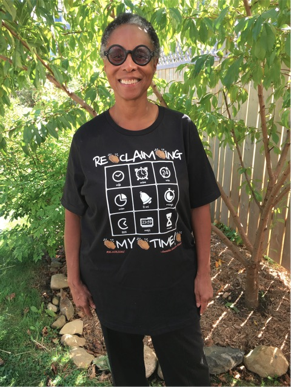 First-time brewer, Evelyn White, is making a statement with her small batch of beer called Reclaiming My Time. White says she was inspired by congresswoman Maxine Waters and the now infamous viral video of her questioning treasury secretary Steven Mnuchin. “For a Black woman to say ‘I'm reclaiming my time,’ I took it as a wonderful symbol of a voice speaking up and standing up for the oppressed,” says White. An African American journalist and author, she feels Waters’ confrontative and bold message is easily transferrable to Nova Scotia. Since she moved to Halifax from BC back in 2012, White says her “jaw dropped to discover how long, painful and distressing the discrimination of the Black community has been” in Nova Scotia. White was a victim of this discrimination in her own neighbourhood in the west end of Halifax when she was street checked and stopped by two white female HRM officers. With the recent UN report claiming that systemic racism in Nova Scotia persists, she believes that African Nova Scotians have long been reclaiming their time in various communities and organizations. “Part of my mission when I'm involved with Good Robot or any mainstream white-owned or -dominated business, is I want to encourage them to look at the racial dynamics in their organization and make it more inclusive,” she says. Kelly Costello, bartender, brewer and organizer of Good Robot Brewing Company's new Communibrew program that encourages both experienced and first-time brewers to make beer, says she hopes to diversify the craft beer community. White spent five hours in early September making the beer with Costello and wanted her to try and recreate her favourite stout beer called Mackeson, which White hasn’t tasted in years. “It's very rich, it has lactose and it has a sweet creaminess to it. We also have roasty notes because of the chocolate malt we used,” says Costello. Reclaiming My Time will be on tap at the Good Robot starting today.